This time of the year is largely marked by a season of widespread consumption, constant discussion and festive thoughts revolving around food. But what if we pivoted the discussions to a slightly different topic, to talk about food waste? Earlier this month, I had the pleasure to host a unique and important dinner party for Kroger to do just that. As part of the company’s nationwide initiative, Zero Hunger Zero Waste, they aim to address two widespread issues that are affecting many around the country. I was stunned and incredibly saddened to learn that 1 in 8 Americans struggle with hunger. 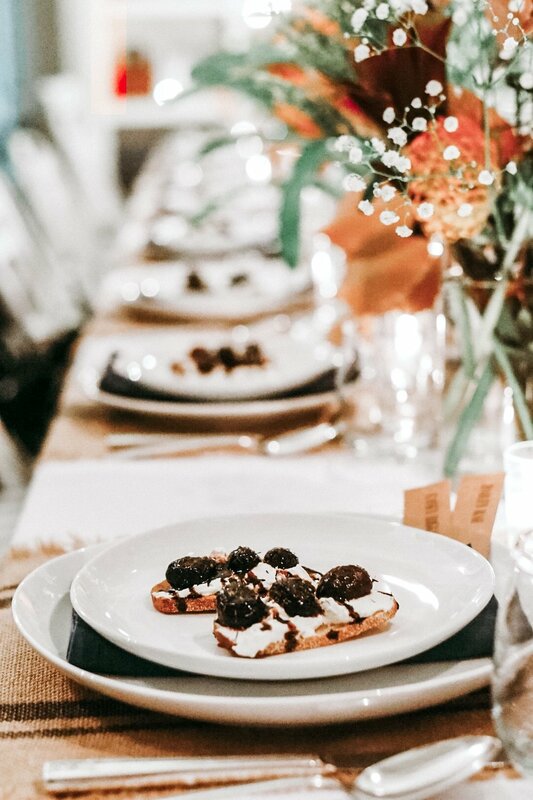 In efforts to raise awareness to the problems of hunger in Nashville and beyond, I partnered with Kroger to host a dinner party to facilitate discussions and provide information about the situation in our city and how we can all help. We gathered representatives from a variety of different fields around Nashville for the evening meal. We welcomed media professionals, members of nonprofits, food bloggers, representatives from the city government and more. We wanted to create a space that allowed individuals from varying fields, backgrounds and expertise to sit down to eat and share. As always, I wanted to set the table using materials from around my home. I used gorgeous branches from our tree in the front and greenery from my backyard to use very homey fall colors and create a seasonally appropriate and natural look. Kroger liaison for the dinner, Melissa Eads kicked off the formal introductions with sharing about the company’s Zero Hunger Zero Waste initiative and why they are so focused on addressing food waste and meeting food needs in Tennessee. She invited everyone to introduce themselves and share about one item that we all frequently find ourselves wasting in the kitchen. Foods ranged from cilantro to vegetables, with the popular items being lemons and limes. After each person shared, you could see head nods from the crowd and hear a murmur of agreement. Clearly, everyone can relate. I moved forward to introduce our menu, inspired by foods that we frequently find ourselves wasting. The first course was a Lemon Ricotta Toast with fresh ricotta, thyme, roasted grapes, balsamic and lemon zest. Milk and grapes are two food items that come to mind when I think about food waste. Fresh ricotta is one of the simplest ways to use milk nearing expiration and by roasting grapes you extend their life by 5-7 days. I am a total soup guru. The second course was a farmhouse vegetable soup with seasonal vegetables, chicken stock and homemade croutons. I gave the recipe to all the guests when they left, as an encouragement and go-to for those cold winter days when you don’t want to go to the store - and don’t even need to! You can pull together this delicious soup with just about any vegetables you have on hand. The croutons are also easy to whip up using any bread that is going a little stale. As guests moved through the courses, they were encouraged by various prompts on the tables to pose questions regarding our community’s food consumption and waste. The room was buzzing as community members shared their experiences, opinions and ideas regarding waste in their own lives and how to raise awareness in Nashville. We were all floored to learn that more than 40% of the food produced in the country goes uneaten. The featured entree for the dinner was a roasted tuscan chicken blistered on the grill with fresh herbs, lemon, drizzled with olive oil. I served it was parmesan polenta and blistered green beans. It’s warm, fresh and an excellent meal of hearty foods that you can easily use in entirety. The night’s menu culminated with an apple cranberry cobbler with vanilla bean ice cream for dessert! Cobbler is one of those dishes you can use whatever fruit you have on hand and need to use up. Though I was busy running around the kitchen for most of the meal, each time that I was able to sneak out to introduce a course and check on the guests, I was so encouraged by what I could overhear. These impressive professionals also serve as mothers, fathers, husbands and wives that could not only bring this knowledge to their workplace but also to their homes. 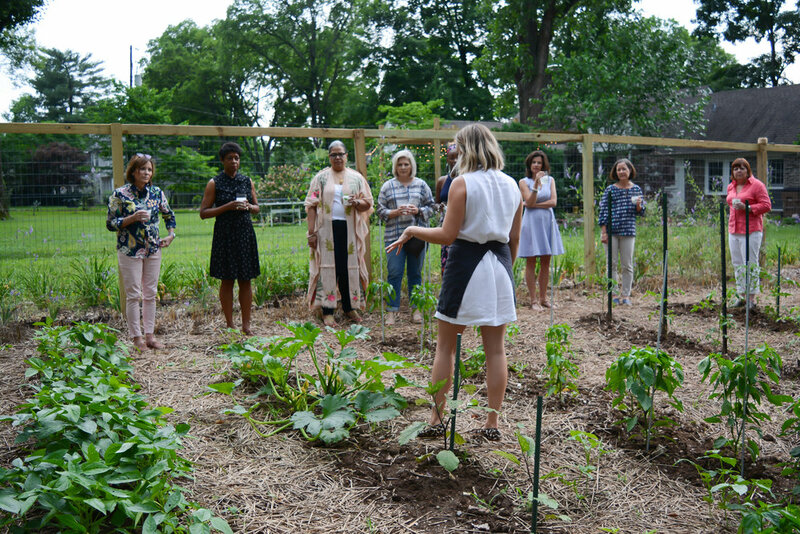 I was honored to host and participate in this incredible evening of learning, sharing and also developing ideas about how to address food waste in our lives and spark important discussions about hunger in Nashville. Everyone left with full bellies, thought-provoking conversations and my pickled vegetables to continue to encourage recycling your veggies (in a tasty way). Guests also grabbed a token reusable Kroger shopping bag in anticipation for the company’s decision to be completely plastic-free by 2025! The evening’s menu was seasonally-inspired, created with careful consideration to the crucial topic of food waste and also printed on “wild flower seed” paper that can be planted in the spring for those honey bees to love! One of my favorites elements to hosting dinner parties is creating a beautiful place setting for each guest. Today I want to share with you a few of my favorite items! These Organic Shaped Dinner Plates are my absolute favorite, they are strikingly beautiful. The imperfect shape of each dish adds a simple but unusually beautiful touch to each place setting. Often I hear guests comment that they love these plates when I use them. A must buy if you are in the market for new dishes or wanting to add a few sets! If you get the dinner plates, you must add on the salad plates - you can hold out of other items from the collection, but the salad plates really complete the look when placed on top of the dinner plates. It is a dreamy set of dishes to own. I am collecting them set by set as I can afford them. Linen immediately upgrades your table, the look and feel is luxurious. They get softer after each wash and hold up against stains immensely better than simple cotton napkins. 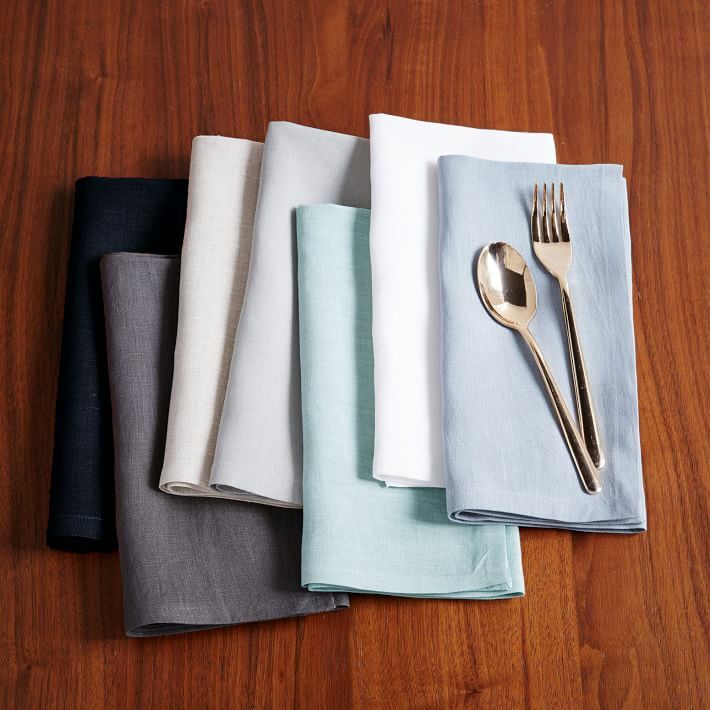 These are also West Elm (no, they are not sponsoring this post) you just can't beat the quality and price on these napkins! They are on sale for $19 right now, with free shipping! Again, I buy a set as they go on sale or as I can afford them, building my collection slowly. I have these in midnight and adore them! Every dinner party I get asked multiple times about my cocktail napkins, and here they are! They are from Amazon, and at $17 for a dozen, they are a steal! Have no fear about the white, from red wine to lipstick, these napkins come out of the wash perfectly, and I swear are stain-proof. I do add in a scoop of oxy clean, but still so impressed by the affordability and durability. I promise your guests will love them and ask you where they can get some! I am obsessed with these glasses - they are only $12 for a case of 12! Thanks to their slender profile, they feel dainty in your hand and are perfect for a signature cocktail or water. These glasses are also extremely durable, after many dinner parties and daily use, I haven't broken one yet! Comment below if you have any questions, suggestions, or need anything. Thanks for reading, I hope this post inspired you to get a few new items to fancy up your dinner table! This will be a dinner party you won't want to miss! Join me, along with the staff at StyleBlueprint as we celebrate the season with a delicious dinner party on Sunday, August 5. Come spend the evening sipping wine and cocktails, digging into a four-course dinner and engaging in memorable conversations. Produce provided by Bloomsbury Farms and my own garden. Beautiful flowers provided by Natchez Glen House. Community. That’s why I started hosting my Garden-Fresh Dinner Parties. I grew tired of only connecting with people behind a screen being a "food blogger" through my website or social media channels. I desired face-to-face connections with others. I am delighted to share it’s quickly became an evening of new friendships forming over delicious, healthy, and garden-fresh food. I am passionate about gardening, so during cocktail hour we head to the garden for those who are interested to see what we have growing in the gardens! Although the crazy Tennessee weather brought a sudden thunderstorm right at the start of the evening, we enjoyed dinner in the library room! 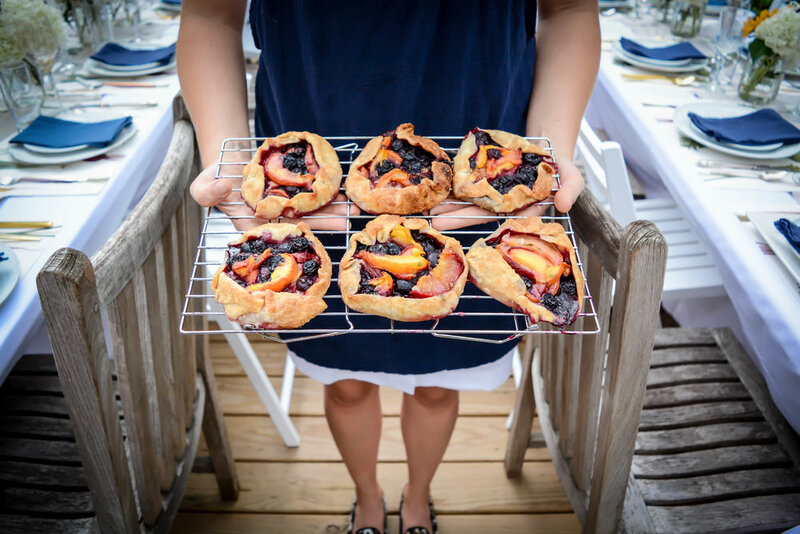 Thankfully the storm moved through quickly and we were able to enjoy the Blueberry & Peach Crostatas outside. A mini ping pong tournament even took place! I started the Garden-Fresh Dinner Parties with the hopes they will become a monthly "supper club", so July's date is in the books! Come to connect, indulge, and enjoy an evening with me sometime, I would love to have you!